And we know Pace ain't doing that when they killed the 325 in the last restructuring for the west burbs and merged its northern end with 303. If we take the alternatives at face value, IDOT is proposing a bus lane that art says can't be used, because 747 was blocked from entering from the Wolf Road area. It might be a different situation if (as I implied) there were a project for I-88 similar to I-90. There are red lines on I-290 and I-88, supposedly for connector buses, but not really any discussion. There is also a red line on 25th Ave., but as also pointed out above, Pace killed 325. With the loop at 17th and Cermak, it sure looks like this report assumes that 325 was still there (as opposed to having a terminal at the 25th Blue Line station). Maybe this forces a restructuring of Pace routes (i.e. no reason to have Forest Park as a major transit hub), but again, no indication that Pace was consulted on any of this. Thus, all this proves is that there is no such thing as regional planning. I'm somewhat surprised that IDOT let CTA in on this, but not that the Tollway and Pace are not. You pretty much summed up my thoughts, from glancing at the presentation, that because its supposed to be a joint IDOT/CTA project in that the Forest Park Blue Line leg gets redone as IDOT redoes the Ike, only IDOT and CTA consulted with each other. Yet several things they're proposing at the very least needs some consultation from the Tollway Authority and Pace because they either seek to undo restructurings Pace did just a couple of years ago at least or simply assumes Pace route structuring that's no longer there. One other thing this project points out or makes more clear, is that not only is the transit structure for Chicago and suburbs too convoluted, but the governing structure for transportation in the entire state as a whole is itself too convoluted in some ways. Speaking of I-290 guys, has anyone recognized the alternative name of the expressway called Chicago-Kansas City Expressway? That was more noticeable on the i-88 Tollway. That seems to be some rejiggering to get a highway around Quincy. On the new, horribly confusing Tribune site is a Hilkevitch column about transit deserts, what being relevant here is someone wanting the Blue Line out to Oakbrook or Downers Grove, as well as the lack of regional planning. Those are both interesting topics though. I remember a proposal for the Blue Line that had it going out to Yorktown Mall, but that's it. Are these new proposals? I've seen it on maps provided by Apple. I followed it to Iowa, but then I lost how it got to Kansas City from there. Not really proposals, but just alternatives analyses. Heck, when the CA&E went out of business, there probably were studies about CTA replacing that. I previously noted that most (except for the center portion) of this was IDOT, which also indicated that extending transit did not pay, apparently at least past Mannheim. BTW, the only relevant source is the link in BusHunter's post. 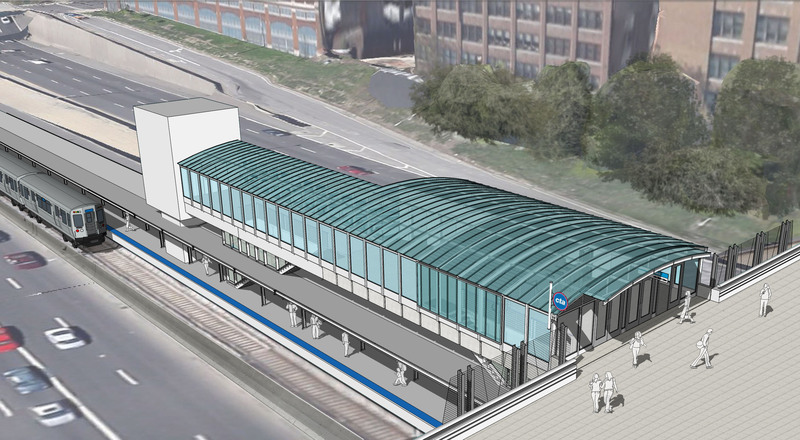 ChicagoL.org updated their UIC-Halsted station page, with some renderings of the elevator tower. One rendering. Looks good, probably the Medical District Ogden entrance will look similar to this. I wish they would do something about those long entrance ramps. Halsted's is not too long but Medical District I think has the longest ones. Would it be too ridiculous to put movable flat escalators like at the airport there, I don't know. They are going to put the stations more under the streets they cross in the FP Renew the Blue renderings, but Oak Park already is requesting they keep the non main street entrances, so they would probably have to keep some ramps to make the stations footprint 2 blocks long including ramps. They probably could abolish ramps at Western, Pulaski, Cicero though so a few would disappear. I wish they would do something about those long entrance ramps. The ramps and the stations were planned in the fifties. Even the platforms designed for ten car trains. The "West Side Subway" was thought as a extention of the initial subways. 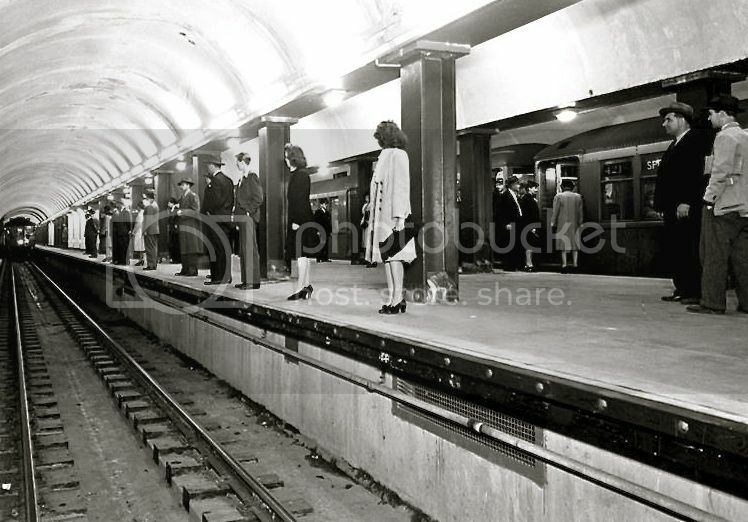 I often wonder did the platfoms included acommodations for wider cars like the acommodations in the two subways. I have video where George Krambles admited before a railfan group that he said the design of the Congress rapid transit stations was a great error. you can see they tried to correct the station errors on the KDR Project. Is that why it seems like that there are 4 portals before/after UIC-Halsted??? No. The portals were for planned subways usually planned to the north replacing the "Loop L". By accommodation I meant the State St. and the Milwaukee- Dearborn subways were designed for wider subway cars. 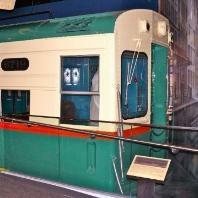 Our subway cars are 8 ft 8 in wide, to this day. The subway were designed for 9 ft 6 in wide cars. New York cars on the B division are 10 ft 0 in wide. Our subways had a wood filler placed on the edges at the platforms. Filler strip shown in this photo before subway opening. Don't tell the "blocking one." By accommodation I meant the State St. and the Milwaukee- Dearborn subways were designed for wider subway cars. Our subway cars are 8 ft 8 in wide, to this day. The subway were designed for 9 ft 4 in wide cars. New York cars on the B division are 10 ft 0 in wide. Our subways had a wood filler placed on the edges at the platforms. Filler stripe shown in this photo before subway opening. Don't tell the "blocking one." Fascinating information! Do you think it would've been a wise idea if our subways were to be over 9 feet wide to this day? Thanks. There's a little bit of fun in studying some history of something. There is a another fact about our subways shown in that same picture. One day I'll reveal it here. At least, Chicago developed a 9 ft. 4 in. waistband with the 8 ft. 8 in. floor. For what it's worth, they were patching up the ramp at Western (Forest Park) station on Thursday morning. With that in mind, would those ramps be "acceptable access" under ADA? For what it's worth, no. What I'm concerned about is one or more ramps collapsing. The reason given in most sources was either that there was supposed to be a subway under Jackson to Michigan and the Van Buren IC station (reflected in Lind's book), or that provision was left for CA&E (Krambles's book) but it went out of business before it could be built. Similarly, there is a portal westbound of the Blue Line subway on Lake in case the Lake service were ever routed there, and the original split portal at 14th and State was that the Archer subway would have gone out that way; instead it was used for the HoDar (current Red Line) and the southwest route (now Orange Line) goes over the top. Nothing to do with Mr. NY subway. ADA probably isn't the reason (as Garmon noted), but it has escaped me why ramps were acceptable to make the Lake Green Line stations accessible (at least between the mezzanines and platforms at some stations, such as Clinton), but not to make the Congress stations accessible. As noted in the illustration, Halsted-UIC is getting an elevator. And for some odd reason, that split before/after Clark/Lake is fenced up. Don't want people to get into it. I doubt that the lower Wacker homeless problem has been cured.